The human liver is the largest organ of the body and is critical in the metabolism of carbohydrates, proteins and lipids but also clearance of toxins and pathogens. To facilitate a broad range of different biotransformation processes, the liver consists of hepatocytes localised in defined areas of the liver sinusoid. 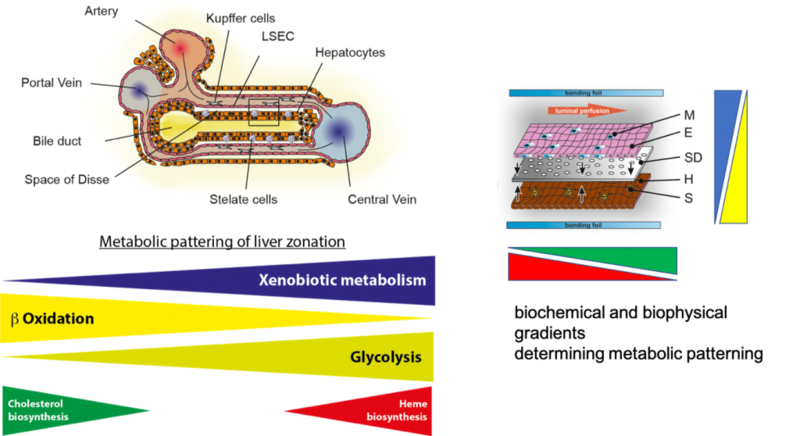 Depending of its localisation within the sinusoid, hepatocytes are exposed to various biophysical and biochemical parameters creating a complex microenvironment that is determining specialized functions of the hepatocytes. This structural feature termed liver zonation is characterised by a defined metabolic pattern ranging from the periportal to the perivenous zone. It has become evident that infectious diseases could alter this expression pattern and thereby affect drug metabolization and the efficiency of therapeutic strategies. Furthermore, toxic effects of drug metabolization were reported that trigger an exuberant immune response during the course of infection. Within the liver, specialised macrophages (Kupffer cells, KC) represent 15% of total liver cells and almost 80–90% of all tissue macrophages in the human body. These macrophages orchestrate acute inflammation, host defense and resolution of inflammation. In the course of infection macrophages are a major source of inflammatory cytokines and coordinate changes in the transcriptional activity of hepatocytes to limit tissue injury and to secrete meditators of host defense. In the project a human liver-on-chip model based on hiPSCs will be established to mimic liver zonation. The aim of the project is to recreate the metabolic patterning and the hepatic immune response in the course of viral and bacterial infections. We will use the model to investigate molecular mechanisms of infection related liver failure and to identify molecular targets for novel therapeutic options of related diseases. Liver-on-chip model: Metabolic pattering in the liver sinusoid (left side) and biological design of the liver model composed of non-parenchymal and parenchymal cells cultured in a microphysiological environment created by biophysical and biochemical gradients under perfused conditions.